As a kid, getting involved in activities centered around service and social justice was something my parents always encouraged me to do. Though these ideals were certainly instilled in me by my mom and dad, there is no doubt that their priority in my life increased by going to Berlin and Prague with Illini Chabad, specifically because of the amazing trip led by Rabbi Dovid Tiechtel. 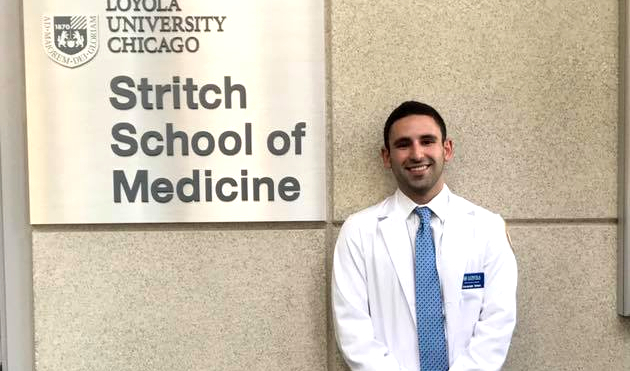 As time went on, part of the reason why I wanted to attend the Stritch School of Medicine was because our values aligned on a lot of the same fundamental drivers in my life. When I started school, I decided to enter the Community and Global Health Honors Program. As part of the curriculum, we are required to complete a certain number of weeks of field service. One of the great opportunities that the ministry at Stritch offers to students is an Ignatian Service Immersion Trip, which is a program whose cornerstone is a summer global health trip to various parts of the world. To me, this seemed like a great way to get started in medicine. I was very fortunate that for the first year ever, Save a Child’s Heart (SACH) was being offered as a destination for the trip. The other wonderful locations were in countries such as Haiti, Belize, Bolivia, Dominican Republic, Ecuador, Guatemala, as well as some domestic trips right here in the United States. So why did I chose SACH? In what can only be described as serendipity, I met a man who worked for SACH during a layover in Brussels on my way to lead a Birthright Israel trip this past summer. We started talking while boarding the plane, and the fact that I would be a first-year medical student was brought up in conversation. He told me that if I ever wanted to come back to Israel, that I should check out the organization he works for. Later on, when I saw that SACH was being offered as an trip at Stritch, I felt like it was meant to be. I love SACH because I believe it is a shining example of what Israel’s role in its region can be. That role, in my eyes, is a force of positive change, which makes the world a better place for everybody; especially in a region as tense as the Middle East. Save A Child’s Heart offers life-saving surgery to children all over the world, regardless of that child’s homeland, creed, or any other identifying characteristic. As well, the fact that a large percentage of the kids accepted to SACH are from Palestinian territories further elevated my desire to participate in this specific program. Although the relationship between the two peoples is incredibly complicated, an opportunity to bridge the divide in any way that I can, although certainly insignificant in proportion to the size of the division, was something I felt that I needed to do. All SACH sees is children in need, and that’s an organization worth dedicating yourself to. I am most looking forward to living with the children that I will be helping in the hospital. The first reason for this is that often in healthcare, the provider-patient relationship is paramount in delivering first-rate care. In the case of my trip with SACH, this relationship will be at the forefront of my experience. I will be living in the same house as the kids for over three weeks, and will be sitting in on surgery for one week within that span. I am interested to see what it feels like to live with the people you are caring for and ultimately, how that affects my attitudes and beliefs surrounding healthcare. I believe that if you are in a position to lend help, it is your duty to do so. At one point, every country in the world was a developing country, and everybody deserves a little support on the way up. Additionally, in the future, you might be the one that needs help. When you break it down into its most simple form, supporting developing countries is really just supporting people and their families. We all share a common humanity and therefore deserve to be treated as equal participants in life on Earth. Assisting developing countries is a step towards making the world a more peaceful and prosperous place. And this idea, called “Tikkun Olam” in Judaism, is one of the greatest gifts one can offer to mankind. That is why I chose to Save a Child’s Heart. You can support Save A Child’s Heart and Donate today.